2nd Lieutenant Rowland Raw of the 9th Battalion, the Lancashire Fusiliers. Son of George H. and Edith S. Raw formerly of South Africa and husband of L. B. May Raw of Churchfield, Witley, Surrey. Born in South Africa July 16th 1864. Died 7 August 1915 aged 31. Mr. and Mrs. Raw lived at Umberleigh House for a time. Corporal John William Beer of the 1st Battalion, the Devonshire Regiment. Son of John and Mary Beer of Trelane, Atherington and husband of Annie Dendle (formerly Beer) of Wisteria House, Nadder Water, Exeter. Born in 1888. Died 3 June 1918 aged 31. Stoker Petty Officer William John Harris of the Royal Navy, HMS Anchusa. Son of William and Ann Harris. Born in Atherington in 1883. Died 16 July 1918 aged 34. Private Samuel Davis. Son of William and Ann Davis of West Down. Born in West Down in 1883. and worked on a farm in Atherington as a carter. All the information we have on his military record comes from this War Memorial. Private Robert Short. Eldest son of John and Susanna Short. Born in the March Quarter of 1893 in Umberleigh, Atherington. All the information we have on his military record comes from this War Memorial. Private William Henry Short of the 9th Battalion, the Cheshire Regiment. Son of John and Susanna Short and brother of Robert (see above) and John (see below). Born in 1899 in Umberleigh, Atherington. Died 21 August 1918 aged 19. Able Seaman John Short of the Royal Navy, HM Submarine "G8". 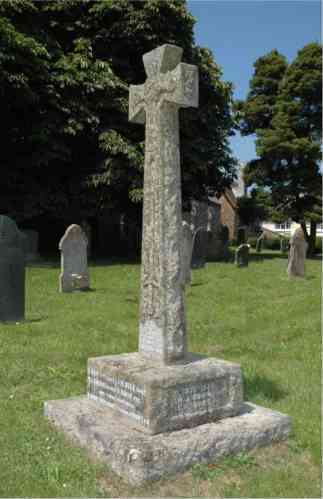 Son of John and Susanna Short of Umberleigh, Atherington. Born in 1896 in Atherington. Died 3 January 1918 aged 22. The date given above for John's death may not be correct. The submarine known as G8 sank in the North Sea while on patrol on 14 January 1918. The most likely possibility is that she struck a floating mine. "The peace of God which passeth all understanding"
Two names appear on a side panel headed 1939 - 1945 and this side of the stone has worn badly so that the names are not easy to read. The first man was a Private Down and we can just see that the second was a Sergeant. But who was "S. H. Squire"? 5620279 Private William John Down of the 1/6th Battalion, the East Surrey regiment. Son of Charles and Ada Gwendoline Millman Down, of Umberleigh. Died 22 November 1944. 1315832 Sergeant Wireless Operator Samuel Lester Squire (Volunteer reserve) of 202 Squadron, the Royal Air Force . Son of Samuel Lester and Elsie Squire (née Topcott) ; husband of Annie Louisa Squire of Appledore. Born in Exeter in the June Quarter of 1921. Died 15 June 1944 aged 23. Samuel Lester Squire was a member of the crew of Catalina JN258 of 202 Squadron which accidentally struck high ground as it came in to land at Melilla, Morocco.